Liebig's Law of the Minimum, often simply called Liebig's Law or the Law of the Minimum, is a principle developed in agricultural science by Carl Sprengel (1828) and later popularized by Justus von Liebig. It states that growth is controlled not by the total amount of resources available, but by the scarcest resource (limiting factor). This concept was originally applied to plant or crop growth, where it was found that increasing the amount of plentiful nutrients did not increase plant growth. Only by increasing the amount of the limiting nutrient (the one most scarce in relation to "need") was the growth of a plant or crop improved. This principle can be summed up in the aphorism, "The availability of the most abundant nutrient in the soil is only as good as the availability of the least abundant nutrient in the soil." Or, to put it more plainly, "A chain is only as strong as its weakest link." 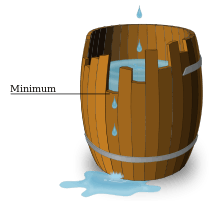 Dobenecks used the image of a barrel—often called Liebig's barrel—to explain Liebig's law. Just as the capacity of a barrel with staves of unequal length is limited by the shortest stave, so a plant's growth is limited by the nutrient in shortest supply. If a system satisfies the law of the minimum then adaptation will equalize the load of different factors because the adaptation resource will be allocated for compensation of limitation. Adaptation system acts as a cooper of Liebig's barrel and repairs the shortest stave to improve the barrel capacity. Indeed, in well-adapted systems the limiting factor should be compensated as far as this is possible. This observation follows the concept of resource competition and fitness maximization. Due to the law of the minimum paradoxes, if we observe the Law of the Minimum in artificial systems, then under natural conditions adaptation will equalize the load of different factors and we can expect a violation of the law of the minimum. Inversely, if artificial systems demonstrate significant violation of the law of the minimum, then we can expect that under natural conditions adaptation will compensate this violation. For instance, in the equation below, the growth of population is a function of the minimum of three Michaelis-Menten terms representing limitation by factors , and . The use of the equation is limited to a situation where there are steady state conditions, and factor interactions are tightly controlled. More recently Liebig's Law is starting to find an application in natural resource management where it surmises that growth in markets dependent upon natural resource inputs is restricted by the most limited input. As the natural capital upon which growth depends is limited in supply due to the finite nature of the planet, Liebig's Law encourages scientists and natural resource managers to calculate the scarcity of essential resources in order to allow for a multigenerational approach to resource consumption (See:sustainability/sustainable development). Neoclassical economic theory has sought to refute the issue of resource scarcity by application of the law of substitutability and technological innovation. The substitutability 'law' states that as one resource is exhausted — and prices rise due to a lack of surplus — new markets based on alternative resources appear at certain prices in order to satisfy demand. Technological innovation implies that humans are able to use technology to fill the gaps in situations where resources are imperfectly substitutable. A market-based theory depends on proper pricing. Where resources such as clean air and water are not accounted for, there will be a "market failure". These failures may be addressed with Pigovian taxes and subsidies, such as a carbon tax. We may be able to substitute nuclear power for coal power, and plastics for wood... but for phosphorus there is neither substitute nor replacement. Where no substitutes exist, such as phosphorus, recycling will be necessary. This may require careful long-term planning and government intervention, in part to create Pigovian taxes to allow efficient market allocation of resources, in part to address other market failures such as excessive time discounting. One example of technological innovation is in plant genetics whereby the biological characteristics of species can be changed by employing genetic modification to alter biological dependence on the most limiting resource. Biotechnological innovations are thus able to extend the limits for growth in species by an increment until a new limiting factor is established, which can then be challenged through technological innovation. Theoretically there is no limit to the number of possible increments towards an unknown productivity limit. This would be either the point where the increment to be advanced is so small it cannot be justified economically or where technology meets an invulnerable natural barrier. It may be worth adding that biotechnology itself is totally dependent on external sources of natural capital. ↑ Whitson, A.R. ; Walster, H.L. (1912). Soils and soil fertility. St. Paul MN: Webb. p. 73. OCLC 1593332. 100. Illustration of Limiting Factors. The accompanying illustration devised by Dr. Dobenecks is intended to illustrate this principle of limiting factors. ↑ D. Tilman, Resource Competition and Community Structure, Princeton University Press, Princeton, NJ (1982). ↑ Sinclair, Thomas R. (1999). "Limits to Crop Yield". Plants and Population: is there time?. Colloquium. Washington DC: National Academy of Sciences. ↑ Reilly, J.M. ; Fuglie, K.O. (6 July 1998). "Future yield growth in field crops: what evidence exists?". Soil and Tillage Research. 47 (3–4): 275–290. doi:10.1016/S0167-1987(98)00116-0.